But Goju was not to remain the sole province of Japan and Okinawa. Mr. Yamaguchi's younger brother, Gosen Yamaguchi, was the first son to move to the United States, attending two years at San Francisco State University in the early 1960's, and by the time he had to return to Tokyo, "he got hundreds of people interested in this art form; he needed someone to take over his positions. So that is why he offered me the job," says Mr. Yamaguchi. In Japan, "I majored in English literature, specializing in American literature, at Meijigakuin University. I was teaching English before I came here in 1964, but no one [in the United States] understood my English because of my accent. So I stopped telling people that I was English teacher," he racalls modestly. "I started taking classes toward my master's degree at San Francisco State. I could not complete it because I got so busy in karate. The karate club was so big that my brother needed instructors. I was also instructing classes at my dojo here at the same time. My intention was to get the mater's degree but I did not have a chance." Literature's loss was karate's gain. My Yamaguchi's knowledge and experience grew, and soon he was ready to follow the steps of his father: teaching - and innovating. "My father systematized all those old fashioned Okinawan Naha styles to a more systematic form," says Yamaguchi. "I remember that their exercise was very simple - nothing but Sanchin, the breathing, using isotonic exercises. "My father wanted us to make the system more systematic - teaching [students] how to close the fist or to move the arms in a stationary form and then move them in motion. Instead of going right into the advanced kata, [there were] some preparations. Some of the Okinwan group never learned that system, so that is the little technical difference. I am not familiar with their exercise, but I don't think their kata is so different [from ours]." According to Mr. Yamaguchi, "the system called free sparring, jiyu kumite, did not exist before 1920. My father was the one, the first time in the entire country, who did the free sparring. 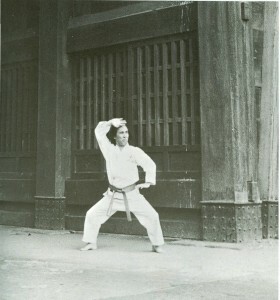 My father wanted to reform the art form to make it more attractive t the young generation, so he created a system called free form, jiyu kumite. Of course the Okinawan people didn't like that. But afterwards, other stylists, like the Shotokan group (or Shuri group) started doing kumite, and it got more popular." SInce the addition of a sparring form was a significant contribution to the Goju system, it would surprise most people has virtually eliinated sparring from his own curriculum. "I don't do sparring," he says outright. "My father started it, and in my generation, I stop," he notes with a good-natured laugh. His reason? The current state of sparring in the U.S., with a high emphasis on travelling across country "to win trophies. Among those young groups of people, it's too much [emphasis] on competitions. And then of course it gives a wrong impression about self-defense, and also those art forms," he says. 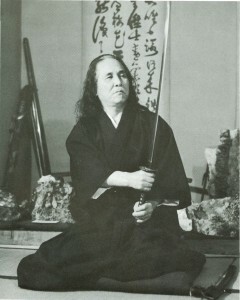 "the martial arts are a discipline to me. If you start giving all this 'sugar and candy' to those young people, [making them believe] that they can fight, covering with the protective gear, and competing in a tournament, it's almost turning int showmanship," says Mr. Yamaguchi with strong emotion. "I'm not saying all [are like that]" he stresses. "I'm sure there are many who are training in sparring forms in a very authentic way, but on the other had, I do see the grotesque type of championship tournament. My concern is safety. You have to learn how to control that kick and strike - not directly hitting against your opponent's body, but stopping half an inch or an inch away from the target. That control requires a lot of discipline of the mind and body, especially body coordination. You have to train to do that. But if your opponent is wearing all of the gear, it is like wearing a safety device [and thinking] when you are driving that you can hit anyone's car without hurting yourself. "It is a similar mentality wit the people. The idea [in many tournaments is know the other person down, which has no sense of beauty. If you execute a strike, kicking with a strict sense of control, it is a beautiful art form and pleasure as well. Unfortunately we are starting to lose that in this generation." Asked about the sparring scene in Japan, Mr. Yamaguchi notes that his brother followed his father's way of teaching, including sparring. "Japan uses national participation models," says Mr. Yamaguchi. "They do not have a name for the style anymore because the club there has one single system. In the name of government administration, they are trying to simplify those techiques and traditions and philosophies into one idea," he says, adding "Japanese have a tendency to do that," with a chuckle. Asked his style's greatest strength, Mr. Yamaguchi does not hesitate to answer, "Sparring!" - a startling response considering that kumite is not practiced in his school. "Karate is one of the youngest art forms in Japan," he explains. "So my father needed to promote the art form. That is why he started the kumite. The Goju stylists are the most notorious in strength and sparring, and became very popular. At the same tie the entire art of karate, including other stylists, became very popular; after my father invented the kumite, other universities with different styles started the same kind of exercise. Then they started to do some exchange competitions among the different stylists. That is the beginning of the sparring championship. "Some schools may even claim that they were the first group to start sparring; I do not mind if that is what they consider. As far as my father is concerned, he was the first to start it. "My father's generation needed to build a new exercise, new events to promote the art form. When it comes to my generation I have to stop." says Mr. Yamaguchi. "Instead of promoting this art form, we have to back to the basics, to educate youngsters rather than using them as a tool for the art form. People have a tendency to do that: using a student or group of people in order to promote your business or art form. Don't misunderstand me, I am not pointing out anything about any particular person' we have a tendency to that - politicians anyone, including myself will do that. But my feeling is, this art form can not be used as the tool to abuse those youngster' minds, because then people start to justify the act of violence in the name of self-defense. It is like TV or Hollywood movies. They are using violence to promote the audience - you have to give them some excitement, that is show business. But then [those same people tell the audience] not to use the violence. To me it does not make sense. What they say and what they promote is contradictory. "My feeling is, instead of those exciting dangerous parts, slowly eliminate them and learn the control of the strike. Everybody gets angry, everybody cries, but we try to control the anger and the sadness. In the physical aspect too, you may be capable of hitting someone with 200 pounds of force, but the first law is not to damage the opponent." Asked if people object to him eliminating sparring, he say, "I think so," with the smile of a teacher who has earned the respect, even if sometimes not the agreement, of his students. But he emphasizes, "They understand my philosophies and they make no protest whatsoever against me. Instead of teaching sparring to them you can learn other techniques, physically and mentally. We do have a traditional system exercise called kata. Using that we can train. At the same time, you can create a certain system of kicking and striking, and then use science [to determine] how fast you can strike the person half an inch away from the target. You train with control." Sparring, however, may be only temporarily put away. "I am not eliminating that concept from the system," Mr.Yamaguchi stresses. But "those championship tournaments that promote sparring, to me there is no sparring there - no control - they are hitting each other. To control your kicks - that is what sparring is. The interview over, it was time to fill the dojo's hardwood floors with lights, electrical cords tripods and cameras for the cover shoot - a process that after seven hours, on emergency call to the photo supply store to replace a demolished bulb, a cancelled karate class and fie rolls of film will yield a portrait of Gosei Yamaguchi. 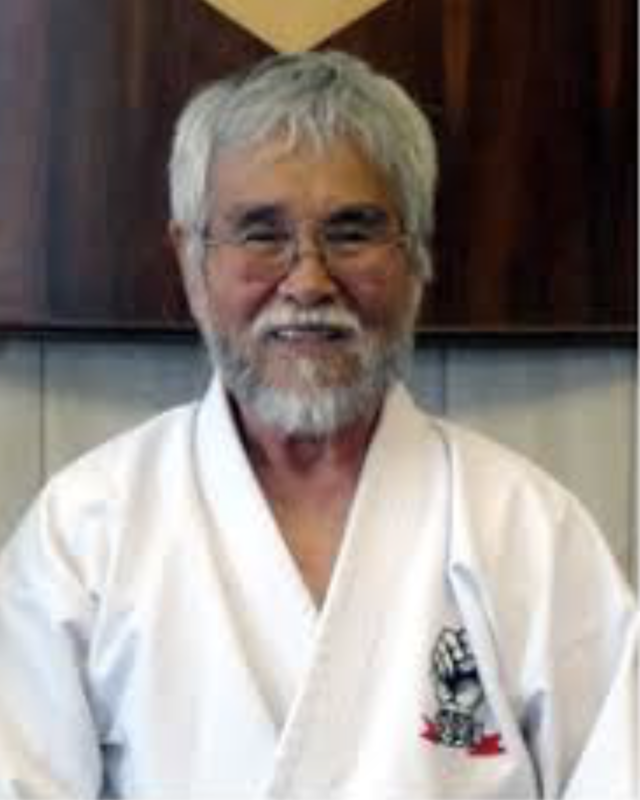 But just as clear a picture was his boundless patience as he sat waiting, the striking metamorphosis when he began his kata, and his quiet demurral after being addressed as Master, that he simply be called Mr. Yamaguchi. These elements, too, prove that legacy has continued.